Everyone has that movie, or genre of movie. The type of movie that just really hits home for some reason and resonates with you as an individual down to your very being. The type of movie that can sum up for you everything that you've been wanting to explain to the world about yourself and your view of the world. It can be a single movie, but for me it really boils down to a certain style of movie that connects with me like no other. After a while I start to worry that they aren't making movies like that anymore and I'll be forced to relive the Rushmores and The Royal Tenenbaums, or the Fargos and Eternal Sunshines. Not that I mind reliving these films at all. On the contrary, these are my favorite films and I could watch them all ad nauseam. I don't buy many movies because I don't really care to watch even the good ones multiple times. But these films I own on DVD. Some of these films have more in common than others. Certainly the works of the Cohen Brothers are going to have a familiar bend, as well as those of Wes Anderson or Charlie Kaufman. But, sometimes when I begin listing my favorite films of all time I find myself repeating the works of only 2 or 3 filmmakers, scattered with a Francis Ford Coppola here, or a P.T. Anderson there. Inevitably, these hardworking folk cannot maintain the same level of excellence and quirkiness that reeled me in originally and are bound to have some stinkers here and there. Or at least, as is the case with The Life Aquatic, the quirky, hip film director/writer ends up making a movie that is trying to hard to recapture the previous creativity and ends up making a decent film that almost parodies his/her previous successes. Making good movies is hard, after all. So, it's always refreshing when a new creative team emerges to pick up some of the slack and make themselves known in their own right. It's even more exciting when that little niche they are carving for themselves somehow fits into the little groove that I've created for movies that especially move me, personally. 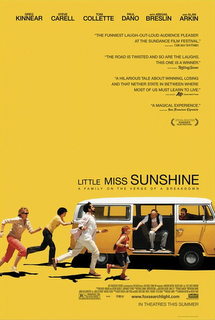 Now, I don't know if Jonathan Dayton, Valerie Faris (directors), Michael Arndt (writer), or someone else is the creative force behind the new dark comedy Little Miss Sunshine. Sometimes it's the directors, and other times it is the writers or producers. This particular movie feels very writer driven. (The fact that two directors are listed makes me think that there might have been some problems leading to the firing of one and hiring of the other...Okay, I just looked it up. They are a husband-wife team.) But, I digress. Whomever is responsible it seems that we have (a) new filmmaker(s) that has(ve) tapped into that rare piece of dark humor and disturbing family dysfunction that makes me just as giddy as a Star Wars Nerd at a Billy Dee Williams booksigning. (I could have also gone with "Premiere of the lost film that's better than Empire", "Chained to the leg of George Lucus," or "Woke up to find him/herself in the actual planet of Dagobah confirming what they suspected all along.") This is the best thing to come around since perhaps Tenenbaums and certainly since Eternal Sunshine. The script just about perfects the dark family comedy genre and the directing and acting are so real and onpoint that this is sure to be a top contender for Oscar nods. I never say stuff like that because I'm almost always wrong, but if this doesn't get lots of recognition from awards I just give up. Speaking of giving up, I've hit on one of the most important themes of the movie. Sunshine finds the dysfunctional Hoover family as each one is going through one crisis or another. The only family member that seems to have a truly positive outlook is little Olive, played by Abigail Breslin in the vain of Christian Bale in Empire of the Sun, that is to say, one of the best child performances I've ever seen. Olive has a healthy and somewhat idealistic view of beauty pageants and wins her local "Little Miss Sunshine Pageant" when the winner is unable to go on to the national level. The family, caught in a bind created by the suicidal Uncle Frank (played by the wonderful Steve Carrell), must all make the long trek to California for the pageant. They are on a time crunch, and so of course they cut it as close as deli meat, running into every roadblock imaginable, and many that you or I would never have thought up. But, this is certainly no cut and paste road trip flick. The relationships the audience is allowed to witness and the way they develop and interact is humorous and real and sad all at the same time. Each individual on the bus (an old VW mini-bus that, among other things, must be pushed to start and cannot go below 2nd gear) is fighting a different and equally frightening demon that plagues them throughout the movie. They all seem to have an ideal way of viewing life and then seeing that they are not living that ideal, have a plan to realize that perfect life without the suffering. One by one each character has their "ideal" ripped away from them and they find themselves fighting tooth and nail to not let the same happen to little Olive. The giving up theme is very important because of Kinnear's character's patriarchal stance that only losers give up. This seems to be the overwhelming drive for each of the family members whether it be to satisfy their father or get away from him. I don't like saying that this is one of the best movies ever, or any so broad a proclamation as that, but the way I felt leaving the theater last night was that it was definitely the best movie I've seen this year and perhaps could be propelled into my top 10 favorite movies ever. It will take time for it to sink in, but I think it's safe to say that this movie will live on in my memory for a long time. Little Miss Sunshine accomplishes the incredibly difficult feat of being a truly dark and sad story that makes you laugh as hard as it will make you cry and then leave you feeling, in the end that you can conquer the world. But even if you don't, give em hell on the way out. Totally agree. We got to see it at a screening in Atlanta before we left for Waco. All that to say, I got to see an advanced screening. I felt really cool. But we loved the movie and I can't wait to see it again. Kudos on having good taste. Bunker Down For a Whoopin'!